edges are 18" and 12" long, and the 18" edge has a 1/4" bevel. The AP7 reinforces the end-condition angles used at the fore and aft ends of larger structures. The 18" edge is positioned against a tip or bottom assembly angle so the plate bridges the gap between the pontoons to which the angle is bolted. The 18" edge is welded to the angle, and the two vertical edges are welded to the adjacent pontoons. APl connecting plates can also be used for reinforcing, welded to end-condition angles in the same way as the AP7. AP8 RAMP-END BENT PLATE: The AP8 is fabricated from steel plate. An 11" x 20 1/4" rectangle is bent to form two legs, one 8 5/8" and the other 11 5/8" long; each leg has two drilled holes for A6B bolts. The AP8 is used for connecting pontoon strings at the point where each string has a P3 sloped-deck ramp pontoon connected to a P1 pontoon. Anew rubber fendering system for use on pontoon structures has replaced oak timber fenders. Rubber fendering is wing-type, extrusion-shaped, styrene butadiene composition; it is supplied in random lengths to be cut, formed, and fitted in the field for specific structures and operating conditions. For each structure, the fenders, brackets, retainers, and fasteners are furnished in the quantities required. The new fenders absorb enough impact, upon contact with the dock or other structure, to transfer shock from dynamic to static load, thereby protecting both of the impacting structures. To install rubber fenders, lay out fendering on the deck over the position to be installed. Cut it to the required length, bolt on the retainers and the brackets, and ease it into position, using lines attached. Tack-weld the brackets in place temporarily, remove the lines, and when the entire fender is properly positioned, weld all the brackets as shown on the drawings. Damaged portions can be cut out and repaired with a rubber portion of the same length. Use odd pieces for drop fenders or bumpers. Use a fine-tooth oil-lubricated saw, manually operated or power-operated, for cutting wood or steel bits for drilling holes. Various fendering arrangements and details are shown in figure 10-12. These are subject to change to meet local fendering needs. Various pontoon structures require a stowage space for tools, chaining, fittings, and miscellaneous gear when not in use. 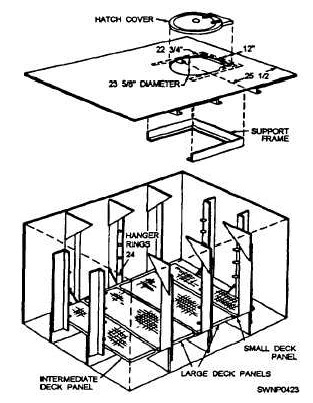 The H6 hatch cover and floor panel assembly (fig. 10- 13) was designed to be installed on any designated pontoon structure and consists of a mounting frame, grating panels, hanger rings, and a 21" diameter, quick-acting, waterproof, flush-mounting, shipboard type of scuttle, together with the parts required to convert a P1 pontoon into a stowage compartment. Making the necessary cutout in the pontoon deck and installing the hatch cover and the other components are done in the field When installed, the hatch cover is a string as the pontoon deck. However, on structures normally traversed by heavy loads, such as causeways and ramp barges, it is advisable to locate the hatch cover away from the regular line of travel-preferably to one side and as far forward or aft as possible - to protect the watertight sealing gasket under the hatch rim. Figure 10-13. - H6 hatch cover and floor panel assembly.